I was delighted to attend my third St Albans School Forum on Education, #SASFE18, on May 12th; quite possibly the best I have been to (perhaps because this year I was relieved of the pressure of running my own workshop!) Mikey Smyth has put together a truly joyful event. It has been kept intentionally small in size and the result is a genuine community feel where you have the opportunity to speak to everyone in attendance, and there is plenty of time given up to networking and enjoying a coffee whilst talking through what you had just heard about in the latest session. Whilst future years will undoubtedly continue in a similar vein, they will be without Mikey at the helm as he is moving onto a deputy headship elsewhere. A big loss for us all in the community, but a wonderful opportunity for Mikey and I obviously wish him the best of luck with it all. Dr Caroline Creaby @CarolineCreaby is a Deputy Head at Sandringham School and Director of their Research School. Caroline started us off talking about what Stephen Hawking, a St Albans School alumnus, has taught her about questioning. Be curious: ask many questions! Hélène gave us the opportunity to openly discuss a number of important themes around using research to inform decisions in schools. There was so much to take away that it is hard to summarise, but we will all have left with a healthy dose of cynicism – in a good way – around the utility of research findings. I have certainly come away with a renewed desire to question everything, and to become more research literate. There is a lot of great research out there, and, as with so much of educational research, there is a great deal that requires careful scrutiny. If an idea is being discussed in school, it is important that we all question that idea and consider what research there around it. Vitally, we have to be conscious of the quality and validity of that research. We cannot simply transfer EEF findings, or Hattie’s metastudies, into our own classrooms because there are so many simplifications and so many different contexts in which the research has been carried out. We spoke a lot about enquiry questions and lesson study, and spent time discussing what makes a good research-informed question. Our school is introducing enquiry questions so it was particularly timely. I expect we will all have left with plenty of ideas on refining our enquiry questions. Lots of great references to the likes of Daniel Muijs and some classic Dylan Wiliam frankness, too. Allana helped us recognise some fascinating biases in questions that we, and notably exam boards, can ask. The one that stands out for me is a Foundation GCSE maths question on percentages and fractions, that was about a trip to the theatre where 3/4 of children were in the stalls and 117 children were in the circle. The language used means that students who have the fortune to have gone to the theatre are at a significant advantage: those who had no idea about stalls and the circle just focused on the word circle and immediately got lost. We had a lot of other discussions, not always around bias, such as why we don’t trust teacher assessment in place of standardised exams (i.e. teacher judgement instead of GCSEs) when those in Higher Education set their own exams and the results of these are trusted. As a result of the session I will now be far more conscious of the levels of bias in what I write and say for lessons, with the mantra ‘avoid context distracting from concept’. I was immediately excited by the mention of myelination and have spent plenty of time since reading up on how it improves conduction in axons…but that was only a very minor part of the talk! We had an expertly executed overview of adolescent brain development, learning about how during adolescence we are at our most physically healthy but also most at risk of a number of mental health conditions. Bettina outlined how our brain is designed with regards to motivation and our desire for rewards, highlighting that the prefrontal cortex is less able to cope with the levels of activation of the motivation/reward centres when adolescents are with their peers meaning that they take more risks. I found it interesting that our brain is essentially wired in a way that means this is essentially unavoidable: social comes before ‘control’ because inclusion in groups activates the reward centre so greatly. Hence why so many adolescents would choose a detention over shame or embarrassment in front of their friends: it’s biology. In Sam’s role at his school, he observes many lessons throughout the year and in those he writes a running commentary of what he sees and hears. 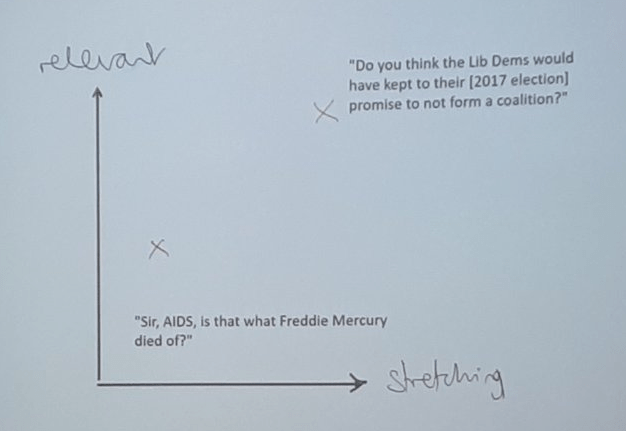 As a result, he has a fascinating collection of questions that students have asked and based this session around which of these were any good and which were not. “Can we take notes on this sir?” and “Should we put a cross or a tick?” are personal favourites of mine, and it made us all think about just how much more fluid lessons can be if students are expected to ask only good questions. Why waste lesson time thinking about and asking about whether to put a cross or a tick when the student already knows the answer to that question? Equally, why waste lesson time asking irrelevant questions, albeit possibly interesting and stretching? Sam seemed particularly angry about the question “Does the constitution really exist?”…of course it bloody exists etcetc. Sam walked us through his ranking system which categorised questions by how relevant and how stretching they were, suggesting that moving towards Relevant and Stretching as being the ultimate. The others, in most cases, need not be asked. I also liked his idea of putting a question in the fridge for later, if it is interesting but not relevant at that moment…and especially liked the fact that students would rarely return to the fridge. We spoke about the importance of modelling good questioning, and explaining why a good question was a good question; something that all of us often say (“Great question!”) without explaining the mechanics of what makes it a good question. Dr Nick Dennis @nickdennis is a History teacher and Deputy Head with a wealth of experience across pretty much every aspect of education. His closing keynote was called ‘Speaking Truth to Power‘. Is school leadership reflective of the diverse community it serves? Is school leadership focused on developing teachers? Is the school wrestling with the curriculum or has it just bought into what it thinks will work? Nick spoke about the McKinsey report which identified that diversity in the workplace ensures the companies are 35% better off financially (when applied to companies as opposed to schools…so the implication is that it would lead to improved outcomes for our students). He explained that over 30% of students in schools are from a minority ethnic background, yet so few in leadership are; citing 1.5% of those in a state school leadership team being black. The data for independent schools is not recorded, but Nick placed an estimate of there being THREE black leaders in total across the whole sector. I would love to know how close that is to the truth. An easy starting point for all of us is to run blind applications – just take the name away from application forms before reading them. Does your school have a culture of learning? Is there a performance management or developmental appraisal culture? Nick spoke about motivational interviewing and suggested that, when aiming for change, utilising the minority that support you as change agents does not work and that there are those addicted to the status quo and will do what they can to retain this. I need to read a lot more on this, but for a lovely five-page summary of motivational interviewing and how it can help with change management, click here. Nick also looked at the Hype Cycle for emerging technologies and compared it to how educational research seems to move in schools. Where on the cycle are we? At the Peak of Inflated Expectations, Nick thinks. We left feeling empowered: “you are here because you have the capacity to change things.” Speaking Truth to Power: we are the power, and we have the means to make a difference. I have certainly taken a lot more away than listed above, but the post is long enough as it is! Thanks Mikey, and thanks so much to everyone else that I spoke to who have helped to shape my thinking.